Run, don't walk to the bookstore to pick this one up. 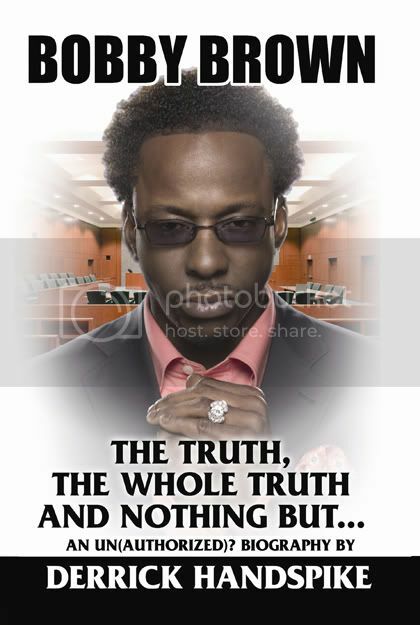 "Bobby Brown: The Truth, The Whole Truth and Nothing But" details the singer's life of drugs, overdoses, relationship with Superhead and wife, Whitney. Plus, it tells the real reason Bobby left New Edition. Plus, he claims Whitney is bisexual and that was the only reason she married him. The book was to be released last June, however, Bobby backed out of the deal - supposedly because Whitney told him to. However, the writer, Derrick Handspike, pressed on. "I never used cocaine until after I met Whitney. Before then, I had experimented with other drugs, but marijuana was my drug of choice," Brown writes. "At one point in my life, I used drugs uncontrollably. I was using everything I could get my hands on, from cocaine to heroin, weed and cooked cocaine." As far as his 15-year marriage to Houston is concerned, it "was doomed from the very beginning. Within the first year we separated, with several more to follow," Brown writes. "I think we got married for all the wrong reasons. Now, I realize Whitney had a different agenda than I did when we got married . . . I believe her agenda was to clean up her image, while mine was to be loved and have children." Whitney, he alleges, had been under "a lot of pressure. The media was accusing her of having a bisexual relationship with her assistant, Robin Crawford. Since she was the American Sweetheart and all, that didn't go too well with her image . . . In Whitney's situation, the only solution was to get married and have kids. That would kill all speculation, whether it was true or not. In the short, I think I got caught up in the politics and ended up marrying one of the biggest stars in the world." But Brown notes that he was no saint in their relationship, confessing in his book, "I am guilty of sleeping with other women . . . Women are always throwing themselves at you. I'm only human, so I would make the mistake and bite the hook sometimes . . . I let the testosterone take over." One of his most public indiscretions was an affair with former exotic dancer Karrine "Superhead" Steffans. "Yes, I've slept with her," he confesses. "Yes, I've spent several nights at her house. But she was only good for what her nickname stood for. She is a terrible mother ...If there is one thing I can't stand, that's a woman who is not a mother to her children. That's a big turn-off to me." "